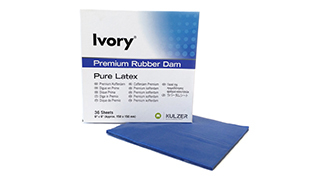 Made from natural latex, Ivory Rubber Dam has extremely high tear strength, reducing waste from tearing during application. The Rubber Dam is thin and pliable, allowing easy placement in especially difficult areas. The bright blue or green tint increases visibility by its contrast. Available in 5x5 or 6x6 medium weight.